Oscar lay on the sea bottom, watching the fish swim by above him. He wondered what sort of fish they were. He pushed himself off the bottom and floated up towards the surface. 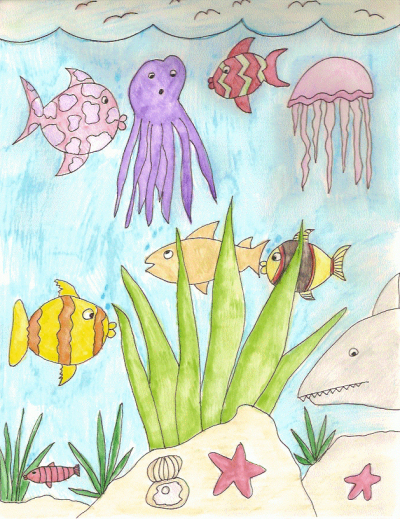 “What sort of fish are you?” He stopped a red and green striped fish and asked. “Why do you have stripes? The fish looked at Oscar. “I'm a striped fish. What are you? Are you a jellyfish or an octopus, or a squid? “What are you, Oscar?” The striped fish swam away. “What am I? What am I? I don't know what I am. I am either a jellyfish, an octopus, or a squid,” he said to himself. “Hello. Can you tell me what I am? Am I a jellyfish, or am I a squid, or an octopus?” Oscar wanted to cry. “How many legs do you have,” the pink fish asked. “You'll have to figure that out for yourself,” said the pink fish and swam away. “Very well,” said the shark. “I won't eat you then.” It swam away, leaving a terrified Oscar dangling in the water. “You're a silly octopus. Those are tentacles,” the golden fish said and then swam away. Life under the sea changed for Oscar. Instead of lying on the bottom of the sea in the sand, he swam about, telling everyone he met that he was an octopus and proud of it.